This picture is one of the last works of Botticelli. Most likely, Botticelli turned to the biblical lines: “And the servant brought her out and locked the door behind her.” And Tamar dusted her head with ashes, and tore the colorful clothes she had on herself, and laid her hands on her head and went on and on screaming “. But whatever legend Botticelli had in mind, in this picture it sounds like a universal theme, and even in our time looks modern. Almost the entire space of the picture is occupied by a stone wall, cut by a deep arch, which ends with a door with points. Only between the points and the arc of the arch is a small patch of blue sky visible. far and incomprehensible. This is the rest of the world, from which a woman is severely and ruthlessly banished, sitting on a step near the wall. She hunched her head in her shoulders, her thick locks of hair randomly scattered on her back, her face hidden behind convulsively clenched hands, her small bare feet on cold plates. On the woman – a white shirt, other things are scattered nearby. Exiled, abandoned, lonely, she remained in front of an impenetrable wall, in front of locked doors that cut her off from the past. The human figure seems quite tiny against the backdrop of the walls that rise up and overwhelm it with their cold. 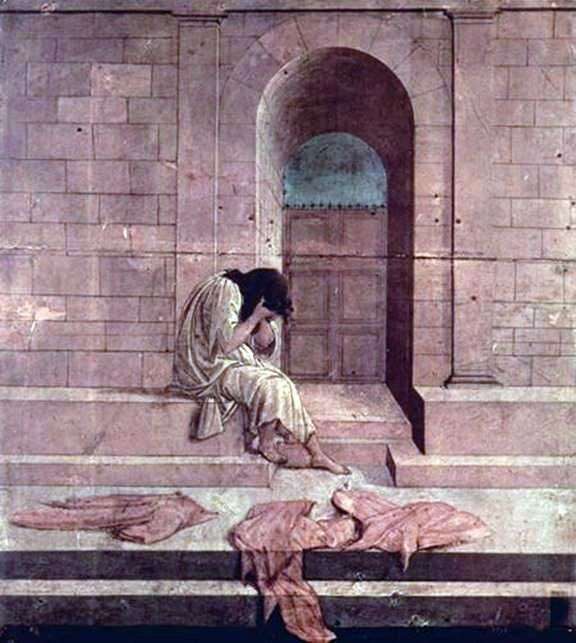 Description and meaning of the painting Abandoned by Sandro Botticelli.